I’m currently working on a new dagger project, as I had very good results with the last one. 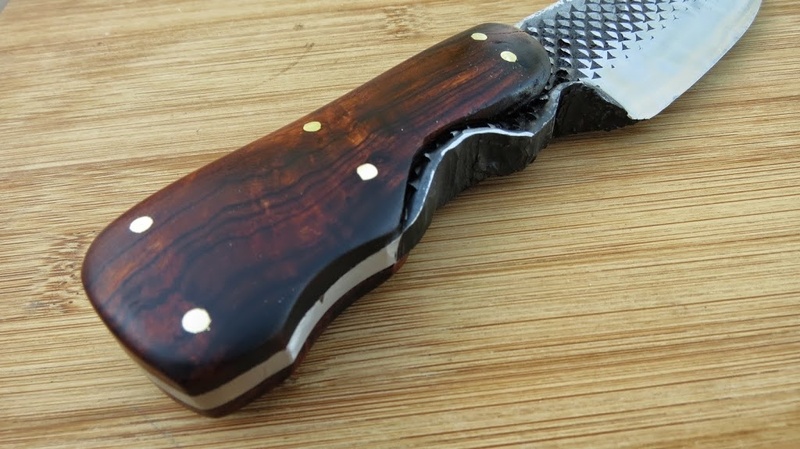 For this one I really wanted to use some ironwood scales, but I only have some thick enough for full tang (where the wood sandwiches the tang rather than the tang is inserted into it, which would be a stick tang). So for this project I’m trying for the first time a frame handled construction. A frame handle construction is where you have a blade with a stick tang. Around this stick tang is assembled a metal case, in my case, copper, essentially transforming it into a full tang. On top and bottom of this, the tang is sandwiched with wood. This way you have the appearance of a full tang, yet before assembling the blade you can slide on a crossguard, which you cannot do with a normal full tang knife (due to the pommel normally being wider in diameter than the shoulder for the guard). This blade was the tip of a shirt sword I forged a while back. I like my last dagger so I decided to do another. I really wanted some ironwood on it though, and all I have is full tang stuff. So what to do? Frame construction, with copper. Perfect fit so far. What think you, a cross guard or more of a bolster? This entry was posted in Uncategorized on May 19, 2015 by Captain Belaq. The bolster of the original handle broke soon after assembly, and I wasn’t happy with the repair job I did, so I destroyed the old handle and replaced it, this time in cocobolo with a curly maple bolster, using the ricasso for a finger choil. The blade was forged from 5160, with forge scale left on. I’m considering removing it but leaving the texture. This blade I forged several months ago but hadn’t got around to finishing, due to my being out of sharp drill bits. Recently I found out an efficient way to re sharpen them and so set about to finish it. The morning of the day I began work however, I went on an Art of Manliness article reading spree, which resulted in the unique finish of this knife. The style is called Brut de Forge, where many rough forged parts are left in instead of ground. 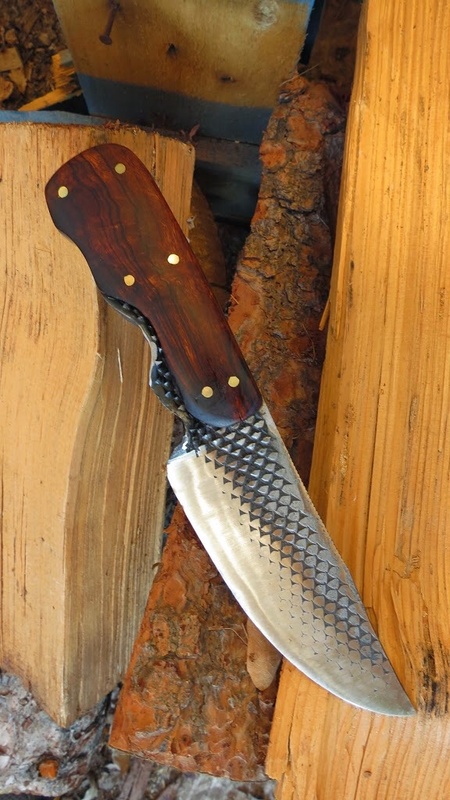 This gives Brut de Forge blades and extremely tough and rustic look, which is enhanced when I combined it with the tough shape and thick, heavy steel, forged from a farriers rasp. The incredibly beautiful ironwood and brass pins balances this out, in a very smooth and refined finish. This combined tough and manly with comfortable, smooth and polite, all ideals that manifest themselves in the art of manliness, and especially the ideal of the “southern gentleman”, hence the name. This entry was posted in Uncategorized on May 4, 2015 by Captain Belaq. When looking for an anvil, we’re told a good trick to test if an anvil is good quality or not is the bounce test; let a hammer drop onto the face of the anvil using only it’s weight to push down and your hands just to stead the hammer. If it bounces only once or twice, it’s bad quality. If it bounces six or more times before coming to rest, it’s very good. But why is that? What makes an anvil good or bad and how does the above test reveal it? Simply stated, a “bad” anvil will form the workpiece very little per given force in a hammer blow, whereas a “good” anvil affects the workpiece much more for the same force. So this is how it all works. Let me explain elastic and inelastic collisions real quick. An example of an elastic collision are two hard steel balls, of equal mass and speed, hitting each other in a zero-gravity environment. Ball A is going five MPH to the right. Ball B is going five MPH to the left. They hit dead on. What happens? They bounce apart. Why? Ball A has transferred it’s kinetic energy to ball B, and vice versa, so after the collision ball A is going five MPH left, and ball B is going five MPH right. An inelastic collision is where you have two balls of playdough in the same situation as above, striking each other dead on. What happens? They stick and flatten. What happened? Because the molecules were not rigid in relation to each other (the playdough is softer) the kinetic energy is used to expand the playdough outwards. Kinetic energy has to go somewhere, and as it cannot go as it had in the direction it was going, it is used to expand the playdough outwards, not into the other ball. The steel balls would do the same, but the force is not great enough to move the molecules in relation to each other, so it is transferred to the other ball. So, going back to dropping the hammer on the anvil. If the anvil face is soft, (inelastic) the energy from the hammer is transferred into the hammer face, and then outwards and downwards, pushing the molecules away, into a dent. If the anvil face is hard (elastic) the energy cannot be used to move the steel molecules apart from each other (bonds are too strong), so it goes right back up into the hammer, pushing it back. Because no material we have is perfectly elastic (which would mean the molecules do not move in relation to each other at all, no material we know of has this property) some is used to move the molecules in relation to each other, and the rest goes right back into the hammer. Each time the hammer bounces a little more is lost until there is no more energy to keep it moving. If both the hammer and the anvil are hard, the hammer will fly back up with the same speed it had going down, which is why as a blacksmith you must be careful not to miss the workpiece. So finally we can get to how this all relates to forging. For ideal forging, we want as much energy as we can to go into the workpiece, into moving the molecules in relation to each other. If the workpiece is hard, most of the energy is transferred from hammer, to workpiece, to anvil, and back to hammer with minimal amounts going into the workpiece. The ideal workpiece is inelastic. How do we make it harder? By heating it up so the molecules move easier in relation to each other. With a good hammer and anvil, the energy is transferred from the hammer into the workpiece. About half of the energy goes into moving the workpiece molecules, flattening it, and from there it spreads out from molecule to molecules until the effect is invisible. The other half of the energy is transferred through the workpiece to the anvil. Maybe half, but more like a third of that energy goes into moving the anvil molecules (but because the workpiece has spread the energy over such a large surface on the anvil, the effect is barely noticeable), then the rest goes right back up into the workpiece. Half of /that/ energy deforms the workpiece some more, while the remainder goes back into the hammer, pushing it upwards with just enough force not to shoot into the smith’s face, but enough to raise it so the smith doesn’t need to do any work to lift the hammer. Then the process repeats. This entry was posted in Uncategorized on May 1, 2015 by Captain Belaq. One of the hardest and most daunting things I’ve learned, and am learning, is perfectionism in my work. When I started out, my goal was to “make knives”, which I accomplished easily. I did the bare minimum in accomplishing that goal, in that I only made what could barely be defined as a knife. My knives weren’t beautiful knives, they weren’t even good knives. They were functional knives, but that was it. A year ago, I went on a trip to Europe and took some knives with me. I visited several bladesmiths and asked them to critique my work, and the main thing throughout was I needed to perfect each aspect of every step before moving on to the next step. If I made a mistake I could not fix, I had to learn to throw it away and start again. This is true, and learning to accept that you can’t fix it and so throw it away is very important. 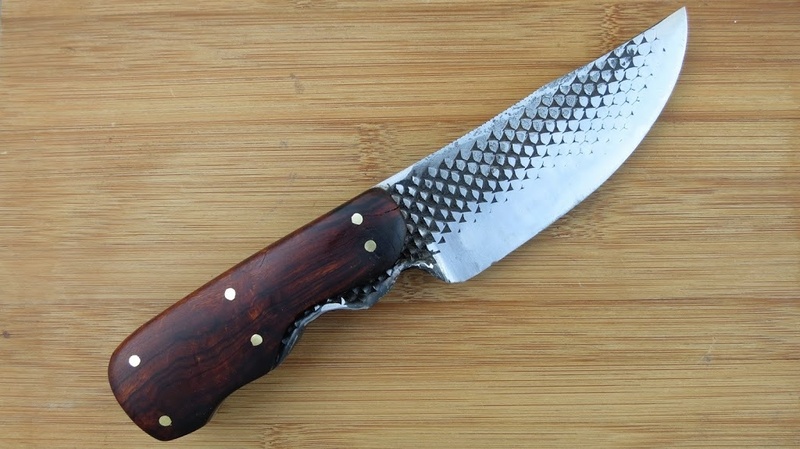 At the time I had the skills to make a good knife, I just lacked the patience and perfectionism. I’m not naturally a perfectionist and so I had to force myself to make each step perfect and have the perfectionist mindset throughout the entire process. “It’s good enough” became a crime. Many people recommend, when you learn something, just do it over and over and make a whole bunch of whatever it is. At first, do so. This is giving you the muscle memory and basic intellect as to how to do the things. But only doing this, your hundredth knife is not sellable. Why not? It’s not flawless. It’s useful. But it’s not perfect. Once you feel you know how to forge, you know how to grind, you know how to peen, work wood, heat treat, and so on, start your next knife slowly. Take a month to do it if you have to. But when you start, make sure each step is done to the best of your abilities. When you forge out the blade, is it too thin? Throw it away. Is there a deep forge mark? Throw it away. When you grind the blade, if you grind too thin, fix it or throw it away. If the ricasso is not lined up perfectly on both sides, take a week to fix it. If you ground a divet too deep, throw it away. It gets harder after the blade is near finished, and after the knife is assembled. Its easy to make a mark, to cut the wood too far, to skip over sanding a barely visible mark out. Don’t let it happen. Make a mental checklist before you move on to a next step, some knifemakers even have a real checklist. It’s daunting and touch, forcing yourself to make each step perfect, but one thing I wasn’t told is that it will become easier with time. It really does. After you force yourself to perfect the knives, and you make a few that way, finishing it becomes habit and it is no longer daunting. You can finish a knife quickly, as quick as before, but it’s still perfect. Habit makes perfectionism a joy, rather than a drudgery. Get through the initial perfectionism stage and it’s smooth sailing from there. This entry was posted in Uncategorized on April 13, 2015 by Captain Belaq. One of the main things with handforged knives that makes it look good, is even forging. If forge marks are still left in the blade after grinding, it really looks horrible. So a smith either has to grind the entire surface down to depth of each hammer divet, or can just initially forge the surface evenly and carefully. There are several tricks to help reduce the amount of divets you make while forging, but mainly it’s caution and practice. First, make sure the anvil is at the right height. If it’s too high, the hammer will strike with the bottom edge, or the “chin” of the hammer hitting. If it’s too low, it will be the “forehead” or the top edge of the hammer that hits. To find the correct height, stand erect with hands by your sides, holding the hammer at a 90 degree angle to your body, and mark on the wall or a board exactly where the height of the hammer face is, and stack up the anvil to that height. This makes it so the hammer face is parallel to the face of the anvil, reducing deep marks significantly. Second, make sure you have a good, firm grip on the hammer. When you grab it, wrap your pinkie finger first then follow the other fingers one by one. Do this until you get used to forging. Before beginning forging, hold the hammer firmly but comfortably, and hold it out directly in front of you. Adjust your grip until the face is facing neither right nor left. Another tip is using a file or grinder of some sort, very slightly round the hammer so the face is slightly convex, so in case you do hit sideways, it won’t make as deep a mark as a sharp edged hammer would. The last tip for even forging, is doing light taps at first until you see the workpiece deforming easily, with no evidence of one or the other hammer edge hitting. Once you have that down, give gradually harder and harder strikes, letting off a bit if you start to hit edge first. When starting out forging it feels and acts like writing with your non-dominant hand, you’ll gain muscle memory quickly and forging evenly will take no mental effort at all. This entry was posted in Uncategorized on April 9, 2015 by Captain Belaq.